As Malaysian we love to eat, food is part of our life and also our daily conversation. Well, eating out and food hunting are part of my enjoyment and bonding with my family and friends. However, sometimes I am not able to deciding What and Where To Eat? That is why I have OpenRice App on my mobile as my gastronomic guide. Recently, OpenRice has upgraded their App features to ease our search, provide us the results that match our preferences, make gathering easier and many more. Basically the newly upgraded OpenRice App is an All-in-One for Restaurants, News, Meal Invitation and Travel. It is the most comprehensive and up to date information for our Food and Restaurant Search, Food Trend, Offers, Table Booking and Meal Invitation. 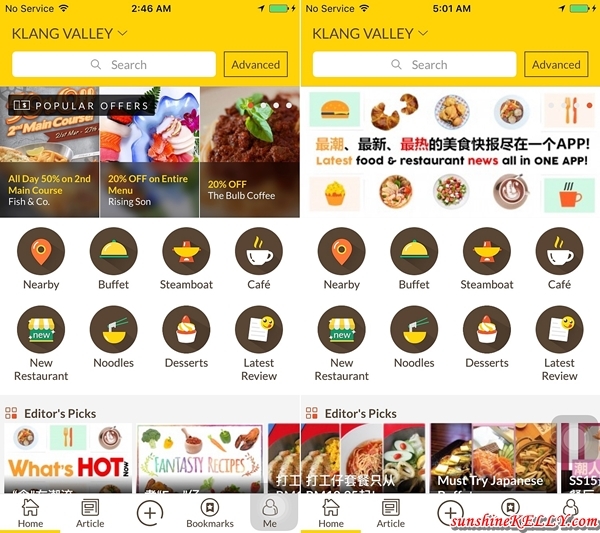 The App was established since 1999 in Hong Kong and it is the most comprehensive platform for online food directory and dining experience sharing. 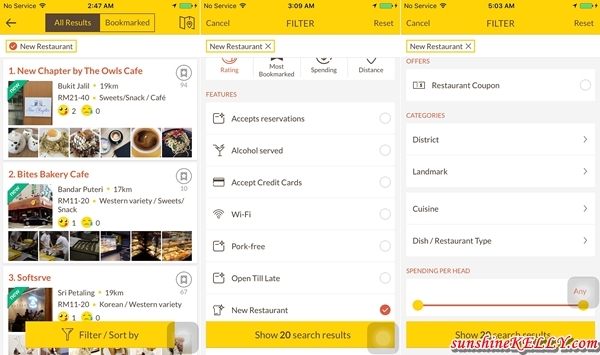 OpenRice has consolidated the restaurant database of Hong Kong, Macau, Taiwan, Japan, Thailand, Singapore and Malaysia in the new version of App (Indonesia is coming soon) offering us more than an ordinary restaurant search engine. As mentioned earlier, OpenRice has upgraded their App features and here are the new features that ease our search and provide the results that suit our taste. Yes! This is my most favourite and frequent use feature of all. All I have to do is tap on the New Restaurant icon on the home page and tadah! I can have all the new restaurants in Klang Valley list in a second. I can also sort out by the categories like Rating, Most Bookmarked, Spending, Distance and also restaurants facilities like wi-fi, alcohol served, pork-free, credit card acceptance, reservations, open till late and new restaurant. These comprehensive features will help to filter or narrow down our search and give us the targeted results that we want. This feature help me a lot whenever I am not able to decide which restaurant to go or when I have the mood to go try out the new restaurant that just opened not long ago. Or I can also add the restaurant or cafes to my shortlist and perhaps the next time I can visit them or create a top 5 or top 10 list of Korean Restaurant in Klang Valley or etc. Yes! OpenRice App is by far the most comprehensive latest food and restaurant news. Just tap on the Article icon you get a list of reviews, editor picks, latest food reviews, what’s is hot and trending, latest food news, trending hot restaurants news, hot offers, delicious ‘Top 10’ food articles and even recipes are now available in OpenRice. There is also wide food news and articles nationwide and globally too, be sure to get exclusive updates on the latest food trends. Now we can be the Foodie in town too. This App is the best to refer to when I have visitors from oversea. The information and food trend or top 10 list does helps a lot when I want to bring my guests out for a satisfying and memorable meal, hopefully they will have good impression on our hospitality. Besides this, I also can contribute and share my dining experience by writing a review and upload my gastronomic photos. It’s pretty simple, just upload the photos and tap on “Write Review” on the bottom of the page and we can share it with our friends on social media such as Facebook, Twitter. WeChat, Google+, Whatsapp, Message and many more. Well this Meal Invitation feature is very user friendly and social friendly. All I have to do is go to the selected restaurant or café, there is icon called ‘Invite’. Tap on that and select the Date & Time of the gathering, don’t forget to name of the gathering and starts to invite friends. Now we can choose up to 4 restaurants of our choice, share it out through Whatsapp, Facebook or LINE and let my friends decide where they most fancy to dine at. Now meal discussions and invitations made easy. Now I can also use this app to search for food and restaurant when I travel also such as in Hong Kong, Macau, Taiwan, Japan, Thailand and Singapore. 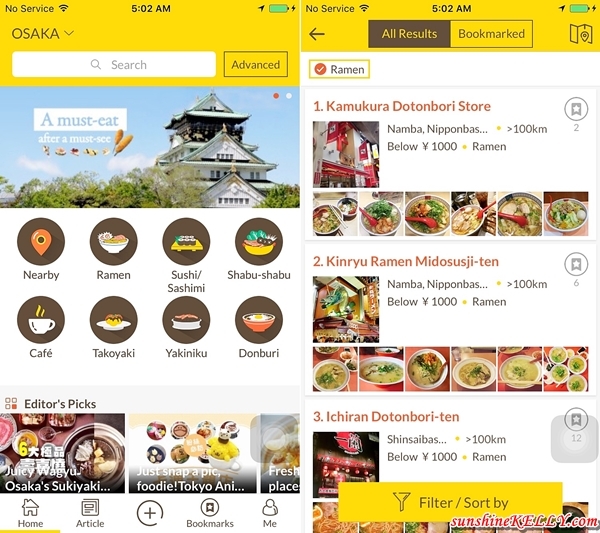 The app now includes restaurant information in Tokyo, Osaka and Kyoto, which help us find good eats when we are travelling. 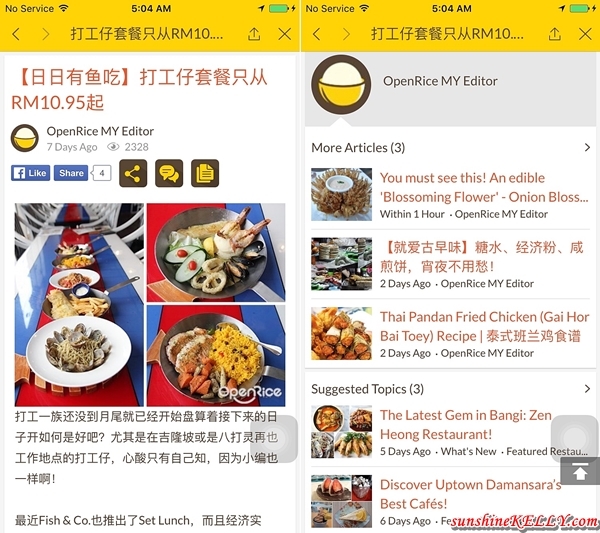 Not only that I also can search overseas food articles, restaurant news and more with OpenRice App. It helps to plan my travels and where to eat as well. Aha! We all love discounts and promotions too. We can find lots of promotions and discount at Popular Offers or Featured Coupons. Sometimes I am spoilt for choice, Buy 1 Free 1, 50% off or Free items on the menu. I have many Muslim colleagues and friends it will be great help for us if there is Halal feature in the sorting function. I know there is Pork-Free feature but I think some Muslim friends would still prefer and feel more comfortable when it’s Halal. Plus will also make our Muslim friends encourage to use the app to as their guide to help them search for food and restaurant locally as well as overseas when they travel. Overall, I like the newly upgraded version of the OpenRice App. It gives more relevant search results and user friendly experience. Now there is less steps to get to what I want, faster and easier. Plus most of the restaurant recommended are quite accurate and suits my preference. The most frequent used features for me are the Restaurant and News Search. I find that the Travel segment has improved a lot. There are more and more countries coming up and OpenRice database is getting stronger. Sometimes so coincident I am going to dine at that particular restaurant and there is a promotion code or voucher on OpenRice that helps to save me some cash as well. So do check out OpenRice whenever you want to dine. 4. Screenshot the features that you like in the App and tell me why. 6. Leave a comment below once you are done. 1. Giveaway starts now and ends on 30th April 2016 (midnight). 2. Giveaway for Malaysian followers only. 3. Winners have to response with their name, email, contact and mailing address within 48 hours after the results is announced. 4. The Vouchers will be delivered to the winners by the organizer. Congratulations to the 10 winners of OpenRice App x Sunshine Kelly Giveaway. 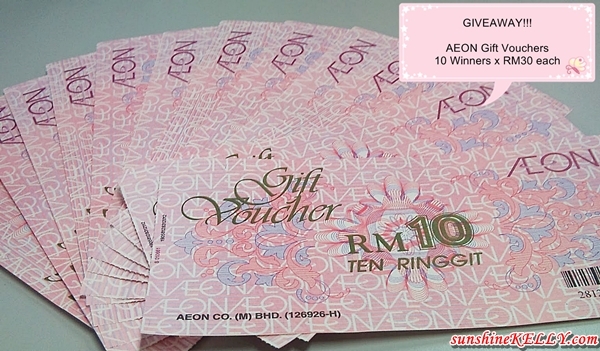 You all won RM30 AEON Shopping Voucher. Please email your full name, email, contact latest by 11th May 2016 to kelly2988[at]gmail[dot]com. Openrice is a nice app that what I have heard from my fiends who are using it. Although I'm not joining the giveaway. Good luck for those participants. I am using the app too. It's easy to use and informative. OpenRice is a great site to locate food choices. This app also looks very convenient. Done. I love their search nearby food function! thanks for recommending this Kelly. 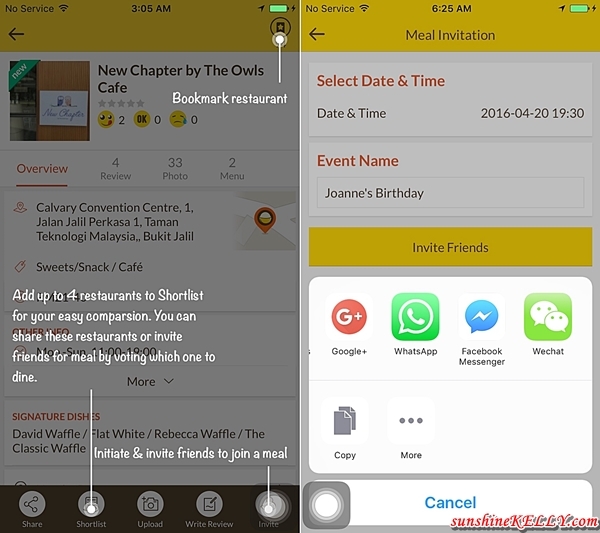 OpenRice is one of the famous apps for malaysian to search for delicious food.. It is indeed a very good food apps as I can discover the latest restaurant using this. tried using it, quite confusing. LOL. Gave up after 2 tries. nice app! a great apps for use! Gud luck everyone! This App is really good. Easier to find the best food to eat when I travel to Taiwan later. Thank you so much for choosing me as one of the winner.